The Floyd Antiques store on Locust Street closed last weekend, leaving a vacant space on the Town of Floyd’s busiest business street. It joins the vacant spot on Main Street that housed the offices of retired attorney Robert Boswell along with my old space and another vacant spot at The Village Green. But some empty spaces have also been filled. The health department moved into one of the two Locust Street-facing storefronts at The Station on South Locust and Mickey G’s Italian Bistro and Pizzeria is nearing its opening day at the health club complex just down Virginia Rte. 8. Local musician Mike Mitchell opened his shop in the other storefront location in the Station and Bookends moved into a new location in The Winter Sun. Some business owners tell me they are hanging on by a thread while others say they have the resources to ride out the hard times: At least for the time being. So, as we head in 2010, should be be optimistic or pessimistic? It’s my understanding that The Floyd Antiques store closed voluntarily; not due to a lack of business. I’m looking forward to Mickey G’s opening. 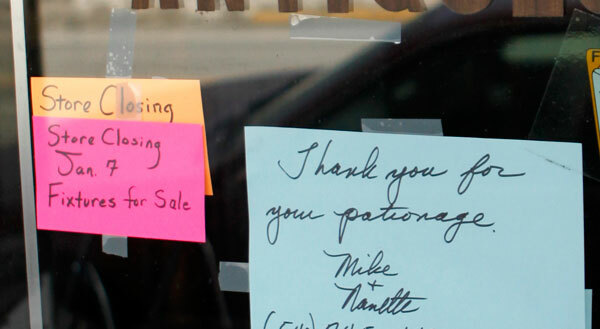 Rick: The owners of the antique store are moving out of the area. Not all closings are economy-related but the economy is certainly limiting the ability of landlords to fill empty spaces. Attorney Bob Boswell retired several months ago and the Main Street storefront space remains empty. Same for the Village Green space left vacant when Realtor Rick Parrish opened a new consignment shop with his wife and moved to the back side of the complex where they have since expanded into a second space. I closed my studio on Oct. 31 and they are still looking for tenant to fill that space. Thanks for the mention, Doug. I know the closing of Floyd Antiques was a complicated personal decision and we’re all going to miss Mike and Nanette. One of the beautiful things about doing business in downtown Floyd is that we “compete” in a very cooperative fashion by helping customers find what they’re looking for. We do what business we can and then help folks find whatever else they need at other Floyd businesses. This keeps shoppers satisfied and helps our fellow shopkeepers which in turn keeps people coming back to Floyd. It is this kind of attitude among the merchants that makes Nancy and I determined to make it work. No doubt in this stage of Floyd’s current “renaissance” there will be some “churn” as it moves toward the ideal business mix but in the end determination and a cooperative attitude will float everybody’s boat.